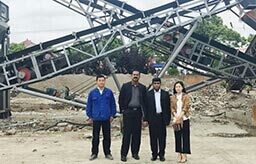 How about the Construction & Demolition recycling equipment of Winner Group? Our construction waste production lines have mature programs and run projects in China. What is the handling material/pictures? Such as construction waste/household garbage. What is the material composition/proportion? The materials are concrete, brick, iron, solid, glass, plastic, organic matter, scrap, etc. Such as concrete: 20%, plastic: 50%, organic matter: 30%. What is input particle size range? The size range of the raw material into the equipment, such as 150-350mm, 500-800mm, etc. What is output particle size distribution? The final products size you need, may be kinds of range, such as 100-200mm, 200-350mm, 350-600mm, etc. What is other special requirements? Depending on the work environment, there may be other special requirements, such as explosion proof, waterproof, anti-corrosion or not. What's the material to process? Light vibrating sifter can process all kinds of powder and liquid, such as coffee beans coconut, chemical material, medicine liquid, etc. What is the material density? It means weight per cubic meter of material, such as 1ton/m³, 200kg/m³, etc. What is the separation destination? May used for uniform particle size, purification, removal of impurities and so on. A layer can be separated from the two materials, the two can be separated three, three can be separated from four, up to 5 layers. What is the opening size? It means what sieve mesh do you need, such as 25mm, 120mm, 270 mesh and so on. What equipment is required? Are there any special needs? Material characteristics such as humidity or sticky and other special problems. How to choose the model of mining vibrating screen? Its depends on the character of materials, and what the equipment is used to do, such as dewatering, remove the muck, sieve the wet sticky material and so on. What are the factors influencing capacity of mining vibrating screen? It means if you want to purchase a mining vibrating screen, you should provide the capacity you need, we will recommended for you depends on your process materials' specification, humidity, viscosity, etc. What is process flow location? It means just a simple screening or the entire production line on a link, we can provide wholesale stone&sand production line, gold ore production line, slurry separation system, etc. What is voltage and frequency? Different country has different voltage and frequency, so we need your local voltage and frequency requirements to design the suitable equipments for you.